Two coffee shops are getting involved in the new Birmingham Cycle Revolution launched this month. First, Birmingham Cycle Revolution have teamed up with local café, Boston Tea Party, to create a ‘cycle smoothie’ which has health benefits for cyclists and we will be giving away free samples next Friday in Victoria Square. The event is part of a wider initiative to tempt people to dust off their bikes and get pedalling. For example, next Friday 27th, is part of a regular fixture on the last Friday of each month to encourage commuters on their bikes. Given the growing association between cycling and coffee shops, it’s great to see BTP behind this initiative. Dale Allison, manager of Boston Tea Party who created the smoothie said that he used “banana for energy and ginger because it reduces muscle soreness for cyclists”. Secondly, Local businesses can also get involved with Birmingham Cycle Revolution at an event on Wednesday June 25th at Urban Coffee Company on Church Street from 12pm to 2pm. The Smarter Choices team will be hosting a free business lunch to inform local employers about Top Cycle Locations scheme and grant process. Thanks to Beth Meads at WPR for the nod for this piece. So, let’s get behind “#BikeDayFriday and folks are being encouraged to send in their ‘Cycle Selfies’ using the hashtag. Coffee Birmingham is delighted to be throwing its support behind UK Coffee Week this year. We are grateful to welcome Isla McLean to our blog to give a brief taster of what the week is all about and what sort of things to look forward to. If you’re reading this, I’m assuming you’re a coffee lover. Get excited because UK Coffee Week is back! This year it is taking place 7-13th April for some fun and to raise vital funds to improve access to safe water for people in coffee-growing countries. There are some amazing things happening across the country… from a coffee selling ‘Vespa’ in Oxford; prisoners learning Barista Skills in Henley Prison to artisan roasters hosting cupping events. In addition, Starbucks will donate 25p for every coffee sold in a reusable cup – so be sure to take your favourite mug to Starbucks during UK Coffee Week! Click here to find out what’s happening across the country and how you can get involved. In our office, coffee is what fuels our day! Why not help us give back to coffee-growing countries by getting your office and work mates involved. Just visit our website http://coffeeatwork.org.uk/ to find out more information and get drinking. The money raised during this year’s UK Coffee Week and through Coffee@Work will help complete Project Waterfall, delivering safe water, sanitation and hygiene to the remote community in the Mbulu District of Tanzania. So far, along with our charity partners WaterAid UK, we have delivered safe water to over 8,000 people, but there’s still more to do. We hope that by coming together we can raise the £100,000 needed to complete this vital work. In Birmingham – Java Lounge (155 Alcester Road) and Urban Coffee Company (30 Church Street) are already supporting UK Coffee Week – thank you! We’d love as many coffee shops as possible involved in UK Coffee Week, so please tell your favourite ones about UK Coffee Week and pay them a visit between 7-13 April to help support Project Waterfall. Thanks to Isla and more info on what is happening locally in Birmingham at our indies will be published in the lead up to UK Coffee Week. I share Isla’s invitation. Let your coffee shops know about the week and get them on board for this great cause. Just a quick message to wish all of our Brum-based baristas competing at the ukbc superheats at Millennium Point this week (9-12 February) the very best of luck. It’s so great to have the Championships in Birmingham this year. If you can’t get over to Millennium Point this week, you can watch all the action here: http://www.ustream.tv/channel/ukbc-2014. Quick congrats to Imogen Ludman from 6/8 Kafe who did such a magnificent job in her presentation this lunchtime! 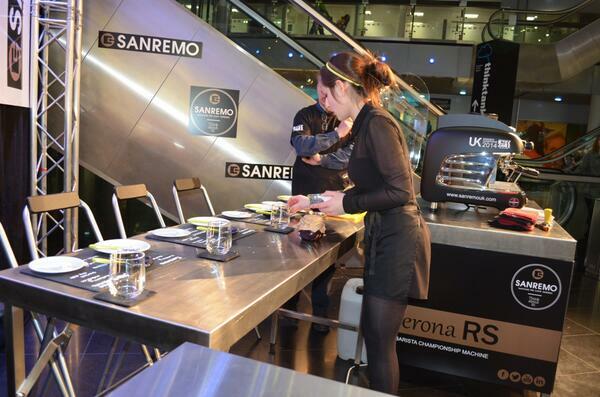 From SCAE website: The UK Barista Championship heats will run throughout the four days with baristas from across the country competing in the regional heats together. Regional winners will be announced at the end of the heats and will be awarded to the top scoring barista from their pre-declared region; one each from the 5 regions of – London & South East and East of England, South West and Wales, The Midlands, The North of England & Scotland and Northern Ireland. We are delighted to join the guys at Droplet Pay who had the bright idea of inviting all the city’s networks to one big Christmas party! Who’s going? Check out all these networks! The networks will support a small tab behind the bar (when it has gone its gone) and subsidising Balti in a Bowl should you want to eat. Now £5, down from £7.50, to help – it is Droplet’s way of saying thank you to Birmingham and everyone that have supported them. Thanks to David Roberts for the opportunity. UK Coffee Week 2013 kicked off today and continues until the 28th April, and will incorporate a whole bunch of stuff happening at many of Birmingham indies. UK Coffee Week – it is a celebration of all things coffee. Over seven days, coffee industry experts get together and showcase different aspects of coffee. Check out the in-store product offerings and activities and giving boxes at a number of Birmingham’s indies throughout the week, and remember to tweet out about your involvement – @ukcoffeeweek #ukcoffeeweek #PowerOfCoffee.